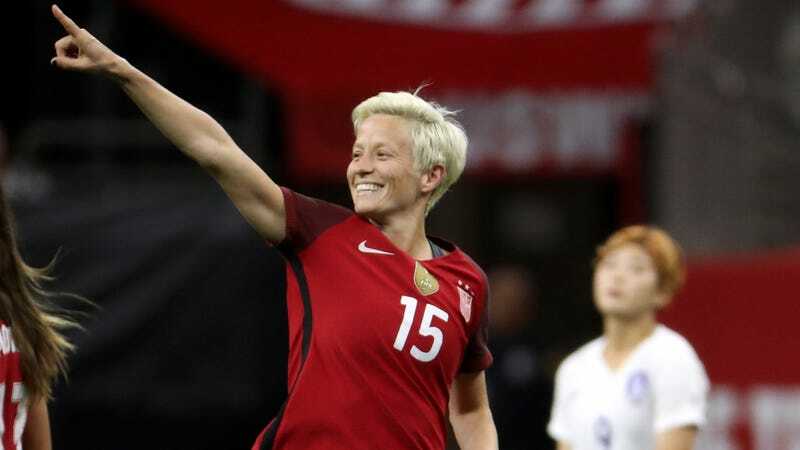 Following the bizarre nomination of an amateur player for FIFA’s female Player of the Year award, USWNT and Seattle Reign midfielder Megan Rapinoe has criticized soccer’s governing body, calling them “old, male and stale” in an interview with BBC. The three finalists for the award, decided by a combination of national team coaches, national team captains, journalists, and fans, were Barcelona’s Lieke Martens (who won), Carli Lloyd, and—perplexingly—Deyna Castellanos, a sophomore at Florida State and member of the second-division Santa Clarita Blue Heat. It’s not that Castellanos is a complete unknown—though Rapinoe says she’d never heard of her. The wonderteen made a name for herself while playing for Venezuela with a stunning long-range winner in the U-17 World Cup, and she did well through the whole competition. But as much potential as Castellanos has, it is extremely weird that she got singled out over, well, literally any professional player. “It signals to us and it signals to the rest of the world that FIFA doesn’t really care,” Rapinoe said. It’s certainly possible that Castellanos eventually becomes worthy of these honors, and Rapinoe’s comments aren’t a diss at her. Rather, FIFA really should have bothered to do something about her nomination to prevent the whole award from looking like a joke.